With her signature smile and generous heart, Rosemary Turpin lived a life rich in family.  A woman who loved and lived wholeheartedly, Rosemary embraced each day and person as a gift. Naturally giving, warm, and happy, Rosemary lived to nourish, encourage, and comfort others. Devoted to her family and community, Rosemary inspired all who were blessed to share time with her. Cherished by many, Rosemary’s bright legacy will continue to shine in the hearts of those she loved. The 1920s were an age of dramatic social and political change. Post-war peace, a booming economy, rising wages for most Americans and falling consumer prices, gave rise to a higher standard of living for most. The world quickly changed with the inventions of wash machines, vacuum cleaners, the band-aid, and the first automobile with a combustion engine. Tremendous confidence, prosperity, and previously unknown comforts marked this roaring decade when a person’s success was largely determined by their ability to identify their desires and then work to make them a reality. In Ferndale, Michigan this vibrant decade grew even brighter for Alfred and Elsa Roberta (Logan) Renaud as they welcomed their daughter Rosemary into their family on March 6, 1924. Named after her parents’ mothers, Rosemary grew up the proud daughter of her hard-working parents. While her father, Alfred worked as a millwright for Ford Motor Company in Wyandotte, her mother ran the home. Her mother, who acted in local plays, often loaned the family’s furniture to the local high school for their productions. Rosemary often recalled the wonder of watching their furniture being carried down the street for the latest show. 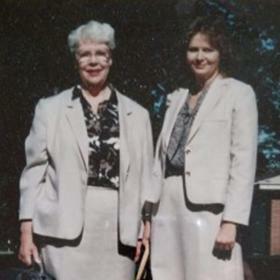 When she was six, she arrived home after school to learn that she had a new sister, Joan. As she had not even known her mother was pregnant, the arrival of her sister came as quite the surprise! No matter, she and her older siblings; Claud, Lawrence, and Hazel welcomed their newest family member with enthusiasm and eyes set on the future. Rosemary attended Hazel Park High School and worked as a sales clerk at the downtown Crowley Milner department store. It was here that she learned about stenography. As she felt her handwriting was poor and she didn’t like shorthand, she thought stenography would be a great option to pursue. 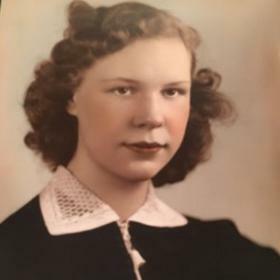 After graduating from high school with the class of 1941, Rosemary enrolled in school at Stenotype Commercial College. 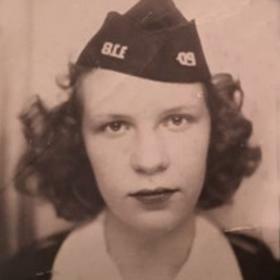 After taking additional night classes for speed, she graduated from SCC in 1943. For a time, Rosemary worked as a security guard for the Packard Motor Company. She took karate, carried a gun, and wearing her special uniform safely escorted people in and out of the plant. It was a good paying job. At one point, she was on the cover of a Hudson Motor Company magazine. Rosemary’s first job as a stenographer was for Army Ordnance Corp. on Grand Blvd. in Detroit where she served as a court reporter and recorded conference calls. While working in downtown Detroit, Rosemary had the opportunity to attend the city’s end of World War II parade. She fondly recalled throughout her life seeing all the soldiers kissing women, celebrating the end of the war and safely arriving home. It was an especially powerful moment for Rosemary as one of her classmates was on the Arizona during the attack on Pearl Harbor. 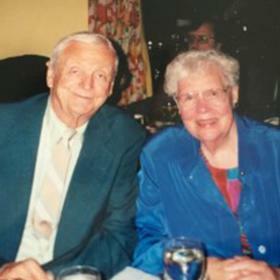 At the age of 25, Rosemary met the love of her life, William (Bill) Turpin while attending a Tip Toppers Club event. A club for tall people, members, had to be a minimum of 5’ 10” in height to participate. Bill’s sister Margaret was denied entrance by Rosemary, who learned about the club from an ad in the newspaper, as she measured a mere 5’ 91/2”. Fortunately, Bill met the requirements and soon he and Rosemary were taking in the club’s events together. As two of the 60 or so members, they enjoyed partaking in the camping, square dances, and bowling activities the club afforded. Their love blossomed, and the happy couple married one year after they met on October 20, 1950. The ceremony was held at Bill’s church; St. John's Episcopal Church in Royal Oak, where Father Jetho officiated. Lucille Rogers (Neiman) was Rosemary's maid of honor. Though Rosemary was able to stand as Joan’s maid of honor earlier in the year, because Joan was very pregnant by October, she did not stand in Rosemary and Bill’s wedding. Bill’s sister Margaret served as an attendant as did Rosemary’s East Detroit friends Mary and Kay whom she met while working at Packard. Bill’s best man was his roommate Doug. After honeymooning in New York, near Schenectady, where Bill had worked for a time at GE, the newlyweds settled into their lives together. For a time, Rosemary worked for the Unemployment Office until they moved to Houghton, Michigan in the Upper Peninsula, where Bill began attending Michigan Tech University. It was here that the couple became parents, with the birth of two of their daughters Linda and Laura. After Bill earned his Bachelor’s degree in mechanical engineering, he found work downstate in Jackson, MI Consumers Power Co., While living in Jackson, Bill and Rosemary completed their happy family with the births of two more daughters, Lois and Loel. Eventually, Bill was transferred and the family made their final move to the beautiful shoreline city of Holland, where they would raise their family, and live the rest of their lives. Rosemary relished in motherhood and family life. After moving to Holland, Michigan, Rosemary concentrated on creating a loving home for her husband and children. An amazing cook, she infused her love and good care into everything she sliced, diced, baked, boiled, steamed, and glazed. She loved to host events and nurture others with her delicious meals. Many a celebration was enhanced and sorrow comforted by the nourishment she so carefully provided those she loved. Not only was she a master of the kitchen, Rosemary was also a talented seamstress whose talents were especially stitched into many Dutch Dance costumes for her children and many other dancers in the community. The very best of friends, Rosemary and Bill truly enjoyed one another’s good company. Bill never left home without a kiss goodbye and every day of the 57 years they spent together, was a good day. They loved to camp, fish, hunt deer, and travel together. They explored the US in their camper and had the good fortune of traveling to many countries by cruise and tour. Some of their most memorable trips included going through the Panama Canal several times and visiting China, Russia, Europe, Canada, Alaska, Australia, and Hawaii. Many of their travels included their beloved dog as Rosemary was particularly fond of her canine companions and afforded many a lovely home over the years. 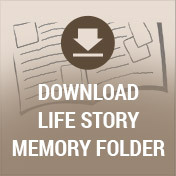 As their lives grew to include the gift of grandchildren, many of their travels centered around their events. Many a trip across the state was delightfully made to watch the kids in various sports, horse and dog shows, and perform in plays. Her family was her greatest joy, and she was happiest when sharing time playing games and cards, enjoying a meal, and celebrating major milestones with each of her children and grandchildren. 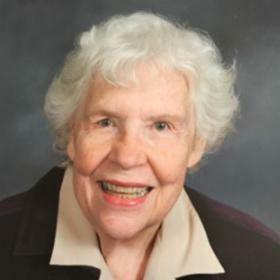 With a strong call to share her love in service of others, Rosemary was a generous member of Holland Newcomers Club and a 60-year member of Beta Sigma Phi sorority. She and Bill were also very active members of the Episcopal Church in Holland where Rosemary was in the Altar Guild. Rosemary also served as a front desk receptionist at Evergreen Commons Senior Center. Without a doubt, the world feels less certain in the absence of Rosemary’s steadfast love and joy. While it is hard to imagine life in her absence, may it afford deep comfort to know that we carry the best of Rosemary’s legacy in our hearts and lives. Each moment we share with our loved ones, enjoy a standing rib roast with cauliflower, snuggle our dog, smell the springtime fragrance of lilacs, or share our abundance with others, we live the gifts Rosemary so effortlessly gave us. In doing so, we assure that her spirit will continue to be a source of inspiration for others. Rosemary Turpin passed away peacefully on Wednesday, January 24, 2018, surrounded by family. A memorial service will be held at Grace Episcopal Church in Holland, Michigan on April 7, at 11 a.m. to be followed by a luncheon. Born March 6, 1924, she lived in Michigan all of her 93 years. She was preceded in death by her husband, William Turpin; sisters, Joan Compton, Hazel Murphy; and brothers, Lawrence and Claude Miller. Rosemary is survived by her daughters, Linda Compton (Rich), Laura Canaan (Mike), Lois Arnold (Dave), and Loel Turpin. She and Bill were blessed with 7 grandchildren and 8 great-grandchildren.